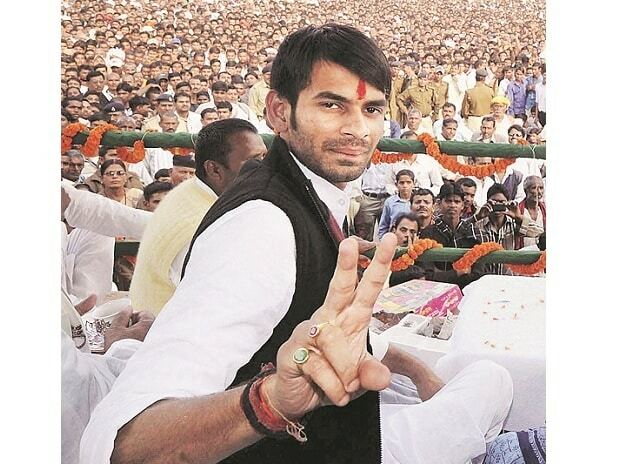 In a remark that could trigger fresh speculations about rift within RJD national president Lalu Prasads family, his elder son Tej Pratap Yadav on Monday made it clear that he would not shy away from assuming the leadership of the party if given a chance. Yadav was responding to queries from journalists at the RJD state headquarters here, after beginning a daily 'Janta Durbar' programme. He had a week ago declared that he would henceforth take active interest in the party affairs. Why not, Yadav shot back when asked if he was ready to take over the reins of the party if the need arose. He also hastened to add The leadership vests with the people and I am here to serve them. The RJD MLA and former Bihar minister had been in a prolonged state of reclusion after filing a petition seeking divorce from his wife of six months as he has been miffed over the refusal of his family to back his decision. He was last week allotted a bungalow by the Nitish Kumar government about a kilometer away from the residence of his mother Rabri Devi, where his father also used to live prior to his imprisonment in a fodder scam case, as he was reportedly reluctant to live with his family members. After announcing the commencement of his daily 'Janta Durbar' programme at the partys Veerchand Patel Marg office on Twitter, Prasad spent close to four hours inside the chamber that had been reserved for his father, sitting on his chair, listening to grievances of party supporters. Responding to queries of journalists afterwards, he said "The Janta Durbar has been started at the party headquarters but I will be similarly holding such darbars at various places including at my assembly constituency Mahua. I do not wish to cause inconvenience to our supporters living away from Patna. There are speculations that the mercurial elder son of Lalu-Rabri has been feeling uneasy with the growing clout of younger but more savvy brother Tejashwi Yadav, who has emerged as the partys de facto leader in the absence of their father. Notably after their simultaneous electoral debut in the 2015 assembly polls Tej Pratap was awarded with a cabinet berth but Tejashwi was appointed the deputy chief minister. After the party lost power because of Chief Minister Nitish Kumars exit from the ruling alliance, Tejashwi was designated the leader of opposition in the state assembly. Also at the RJDs national council held here last year a resolution was unanimously passed in the presence of Lalu Prasad declaring Tejashwi as the chief ministerial candidate for the next assembly polls. Tej Pratap Yadav has often remarked, drawing an analogy from the epic Mahabharata that he saw his younger brother as Arjuna and himself as Lord Krishna. The remark has often been construed by opposition parties like the BJP as an expression of resentment against Lalu Prasad for favoring the younger son ignoring the claim of the elder one.